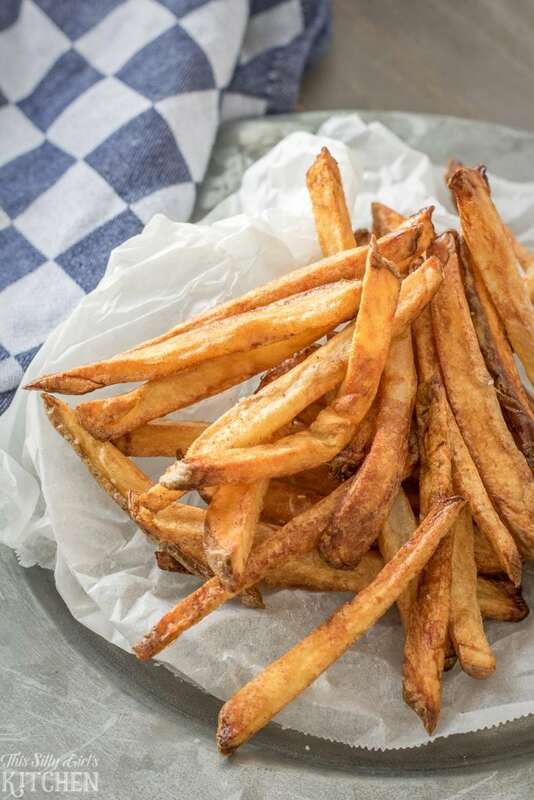 Homemade French Fries, your favorite restaurant staple at home! 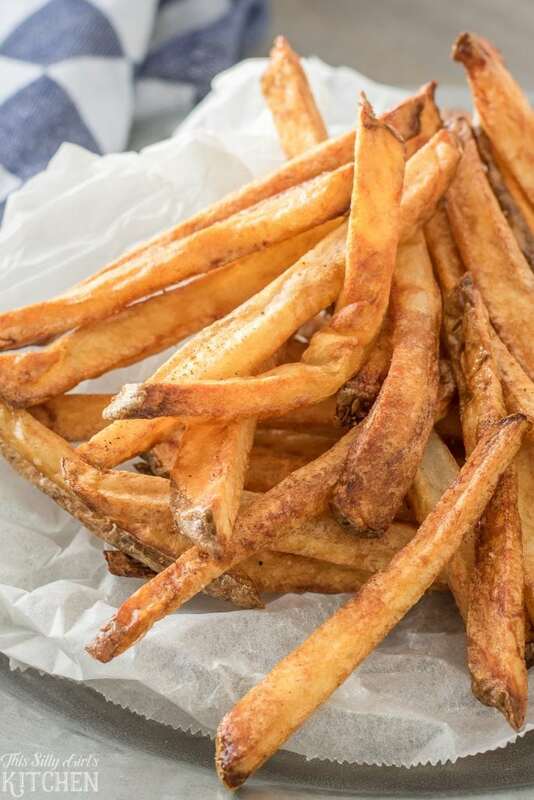 Homemade French fries are easy to make at home with just 2 ingredients. One of my favorite side dishes to order out at a casual restaurant or BBQ joint are crispy fries. BUT, they have to be hand-cut homemade fries or I’m not into it. To me, there is nothing better than homemade french fries. 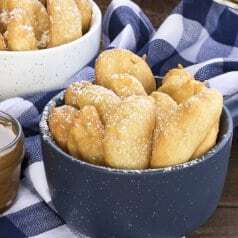 With a crispy exterior and soft, almost creamy inside… they are just so addictive to me! Slap me a bottle of homemade ranch on the table and I am in Heaven! OR, this chili cheese fry dip *cue the church choir music*! Until recently, I picked up a countertop deep fryer. This is the specific model I got. And I. AM. IN. LOVE. It makes making Homemade French Fries so easy and fast! Not only can I make homemade fries whenever I want, oh no… the possibilities are endless with this baby! I use it to make my Southern Fried Chicken, Red Potato Wedges, Chicken Tenders… and on and on! Take me to the recipe for Homemade French Fries already! 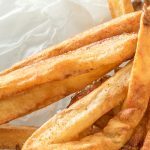 If you would rather not hear my super helpful tips and tricks, FAQ, and my overall awesomeness and get straight to this delicious Homemade French Fries – you can very easily scroll all the way to the bottom of this post for the full printable FREE recipe! Bon appetit. 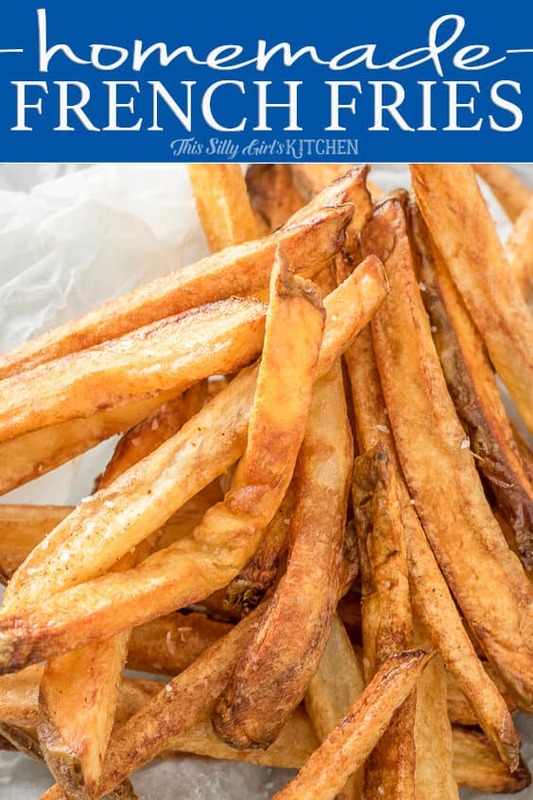 This french fries recipe is so easy and so delicious- it’s dangerous! Making your own fries at home might seem intimidating but, as long as you have this technique down there really isn’t anything to it! What potato to use for homemade French fries? All you need are a few russet potatoes. You can peel them or, for a rough look (and, if you’re lazy like me), leave the skins on but scrub the heck out of them until they are nice and clean. 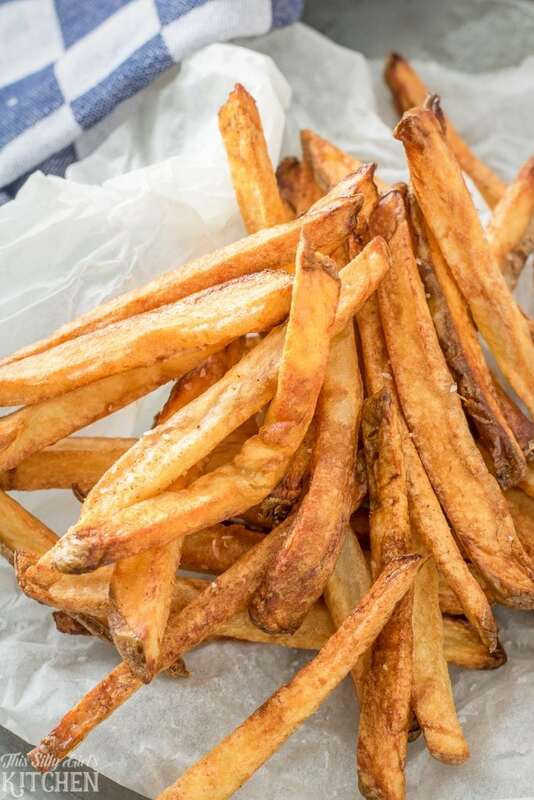 How to make homemade French fries in a deep fryer? Cut the potatoes up into fry shape, trying your best to make them as close to the same size as possible. I cut them about 1/2 inch size. The bigger they are, the longer they take to cook and vice versa. Keep that in mind. Fry at 320°F 10-12 Minutes, remove and shake then..
How to make homemade French fries crispy? Frying the potatoes twice at two different temperatures make the fries crispy! They get fried the first time at 320°F in oil. The first fry cooks them without burning and this is where they get their creamy texture. The second fry is at 375°F and is considered a flash fry, they don’t stay in as long. This makes the outside nice and crispy. What is a good French Fry seasoning? Season them up with kosher salt and season salt and you’re done! It’s really that easy. How to make homemade French fries in the oven? Lay them on a baking sheet and bake for 40-45 minutes until tender. I suggest turning them a few times, about every 10 minutes, to ensure even cooking. How to make homemade fries on the stove? Cut 2-4 russet potatoes into 1/2 inch fry shapes. Heat 1 cup of vegetable oil on the stove in a large, heavy bottom skillet over medium-low heat. You want to make sure the oil just covers the potatoes, you may need more or less oil. Cook for 15-20 minutes until golden brown, stirring occasionally. Drain fries and add French fry seasoning of your choice. The Best Homemade French Fries! Preheat deep fryer to 325°F degrees. Cut potatoes lengthwise into about 1/2 inch sticks. Place cut fries into cold water until ready to fry. Take the fries out of the water in batches and dry them off with a clean kitchen towel. CAREFULLY place them into the hot oil using a fry basket and cook for 10-12 minutes. There should not be a lot of color on the fries at this point. You will need to fry in batches. Shake off excess oil and dump fries out onto a wire rack that is sitting on a sheet tray. Turn up the heat on the fryer to 375°F degrees. Again, carefully place the fries back into the fryer using the fry basket. Cook for 2-3 minutes, until the exterior is golden brown and crispy. Shake off excess oil and dump back onto the wire rack. Immediately season with season salt and kosher salt to your taste. This recipe looks amazing! I can’t wait to give it a try! You have totally just inspired me to dig out and dust off my old fryer! I use red potatoes because they come out sweeter and barely need any salt. But I do have a question, I’ve never double fried before and I want to do thick, soft steak fries but my fryer doesn’t allow me to regulate the temperature… any suggestions? You really need to know what the temperature of the oil is. If you cannot regulate the temperature, I suggest you get a candy thermometer and keep that in the fryer.